Look below and memorize (or bookmark this site for future reference). 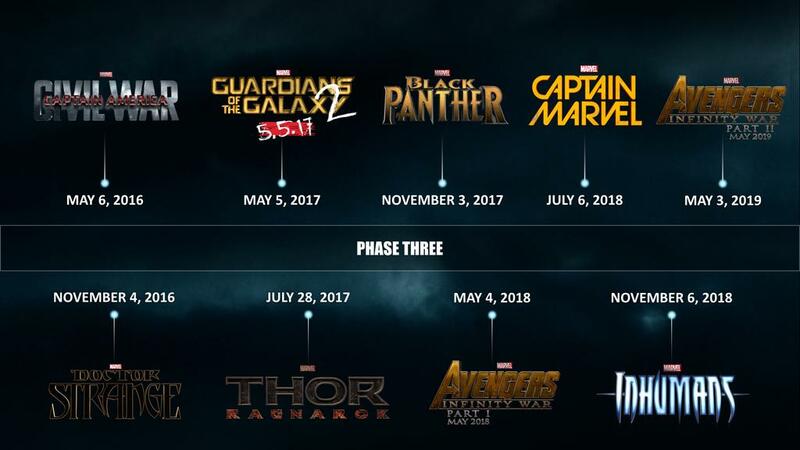 Behold the Marvel Cinematic Universe (MCU) Phase 3 Timeline. You can also read a big more about the MCU thanks to the Mary Sue: Marvel Releases Official Phase 3 Calendar Image, Chris Pratt is Ready for His SHIELD Cameo. OMG – there is even talk of Agents of SHIELD. I am such a happy camper. Talk of an Agents of S.H.I.E.L.D.movie?! That WOULD be awesome!